The Aisle Seat - Shazam! Shazam! can't decide whether it wants to be a superhero movie or a parody of one. That's a real shame, because the film is clearly trying to give audiences something a little different. Given that we seem to get a new comic book-based adventure every other week, the attempt is admirable, if not entirely successful. Things begin with a slow, protracted first act about a wizard (Djimon Hounsou) looking for a “champion” who is “pure of heart” to whom he can bestow his immense powers. One choice, a kid named Thaddeus Sivana, doesn't work out. Years later, he tries again with a foster child named Billy Batson (Asher Angel). That takes up about 35 minutes of the film, at which point the proper story kicks in. Billy is able to transform himself into a multi-powered adult superhero (played by Zachary Levi) simply by saying the word “Shazam!” Initially, he and his foster brother Freddy (It co-star Jack Dylan Grazer) enjoy playing around with his special abilities. Then they discover that the now-grown Sivana (Mark Strong) is out to destroy Billy and usurp everything the wizard gave him. Shazam! has a pretty substantial flaw front and center: Zachary Levi is badly miscast. Billy is supposed to be a 14-year-old boy in an adult body. Tom Hanks in Big made that kind of thing three-dimensional, conveying the wide range of emotions his character felt about the predicament. Levi, on the other hand, plays the same goofball ”Wow, look what I can do!” note again and again. It's a big, over-sized comedic performance in a role that would have greatly benefited from some occasional subtlety. Playing Billy at a high pitch for two hours causes him to become slightly irritating. Much of Shazam! is intended to be a funny, family-friendly superhero romp about Billy learning how to use astonishing powers like being bulletproof and shooting lightning from his fingertips. Weirdly, though, scenes of lightweight self-aware humor brush up against dark, scary sequences involving Sivana's demons, who feast on his enemies and, in one scene, throw people through a skyscraper's windows to their doom. Those wildly different elements don't mesh together well at all, leaving us unsure of how seriously we're supposed to take the movie. For comparison, consider Spider-Man: Homecoming. 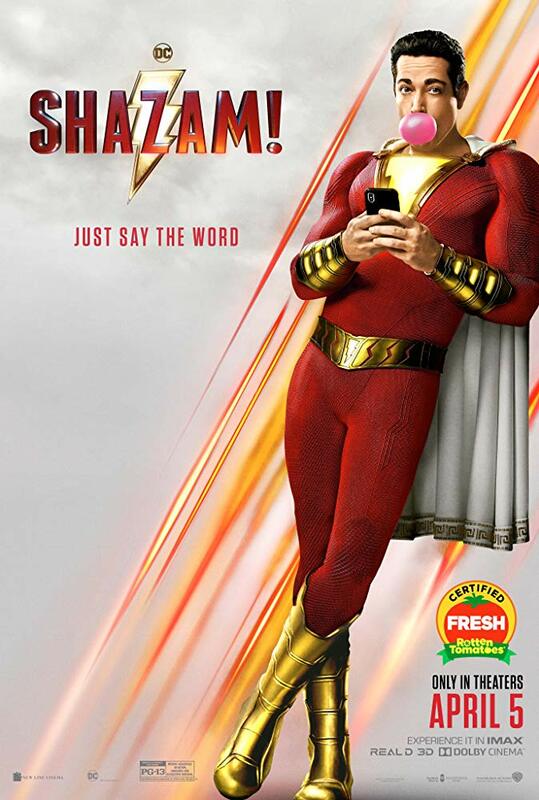 That movie does most of the things Shazam! tries to accomplish much better. It integrates traditional superhero action with teen-based humor more effectively, and Tom Holland gives a stronger turn as an adolescent coming to terms with newly-acquired skills. The villain, Vulture, is additionally much more charismatic than the unremarkable Sivana. On the plus side, there are some funny scenes in Shazam! The story's big finale – which takes place at a Christmas-themed carvival – is fairly rousing and features a cool twist involving Billy's foster family. Director David F. Sandberg (Lights Out) does a very good job of making the superhero stuff seem like it's occurring in the real world. Visually and tonally, Shazam! brings the fantasy into reality, rather than inserting reality into fantasy, as most superhero tales do. Despite some intermittent pleasures, the inconsistent nature of the plot and Zachary Levi's one-note performance render Shazam! a minor DC effort. Shazam! is rated PG-13 for intense sequences of action, language, and suggestive material. The running time is 2 hours and 12 minutes.